The first I heard of the Broad Street 10 Miler was when I was in Baltimore for work last year. A couple at the hotel I was staying at struck up a conversation with me because I was wearing a race shirt. They told me I had to run the Broad Street 10 Miler in Philadelphia because everyone comes out and it’s a 10 mile party all downhill. Hello, you had me at downhill! A big party with 40,000 runners is also my idea of a good time so I put it in my calendar to check out. Then all my fellow Shenanigans started telling me how fun it is and they too wanted to run it so we all entered the lottery as a group — that way if one of us got in we were all in! There is an option for team I think which is different and makes you pay more so if you are thinking about running this just have someone create a group so you all get in. I’m not from Philly but apparently they are a big deal. 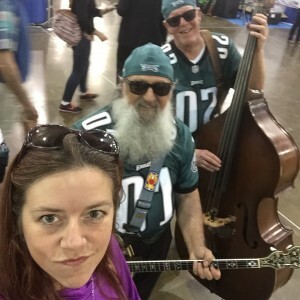 I just thought they were cool and wanted a selfie! The expo was also handing out free Turkey Hill Hazelnut ice cream – pretty much best expo Eva! Honestly though besides being excited to have most of the team together again we were in Philly and we couldn’t wait to see Rocky and Eat! We also wanted to donate some pizza for the homeless and other broke hungry people at Rosa’s Fresh Pizza in Center City, which was featured on NPR and Ellen. You pre-pay a dollar for a slice and put a Post-It Note on the walls. Anyone without a dollar to spare can take a post it from the wall and redeem it for pizza. It’s an amazing place and we were honored to buy a few! So after a day of ‘carb loading’ it was time to run! I’m sure that a lot of people use this race for time, but running fast doesn’t really allow for shenanigans! There will always be races for time but when you are running with friends it is just more important, for us anyway, to have fun! 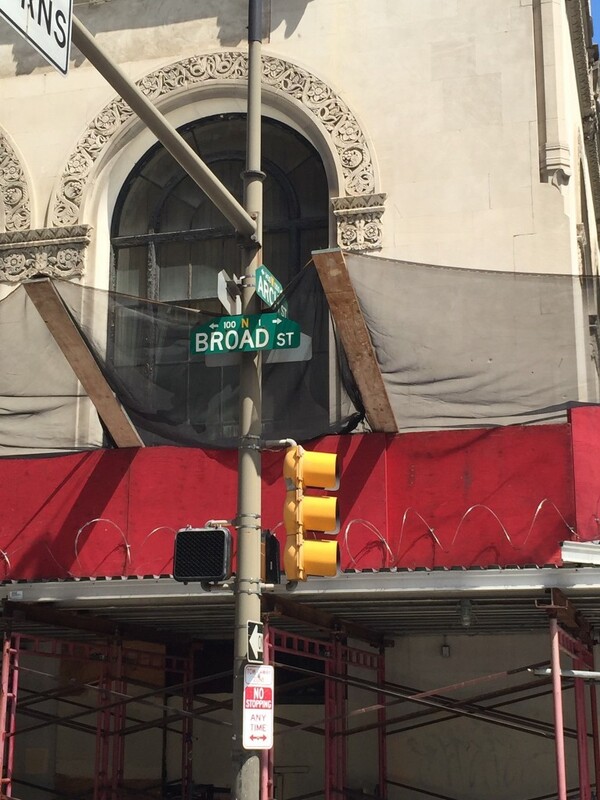 The Broad Street 10 Miler is a point-to-point race, meaning you don’t end at the same place you start. We parked near the finish line and took a free ride (for participants) on the subway to the start line. We were told there were like 15 Dunkin Donuts along the course so first stop was the DD at the start line for coffee! Then we made our way to the corral and decided to hit the porta potties. We were in third corral which went by colors instead of numbers – probably to make everyone happy instead of feeling slow for being in a higher numbered corral. I mean who can be mad in a pink corral! Didn’t take long and we were running! Also didn’t take long to call the race BS because it wasn’t all downhill! It was 85% downhill, 10% flat, and 5% uphill which was the BS part and I complained for all to hear on first of like three hills. Ok so they were tiny anthills but still! It didn’t take long to get into trouble! Do you know cops won’t pretend to arrest you! I mean don’t they need to practice?! The Broad Street 10 Miler was awesome despite the anthills – the support was everything we were promised and it was a huge party. 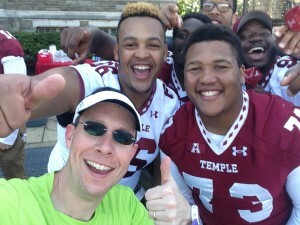 Even members of the Temple Owls football team were out there cheering! This was my favorite sign of the race and right near the end when I needed a laugh. 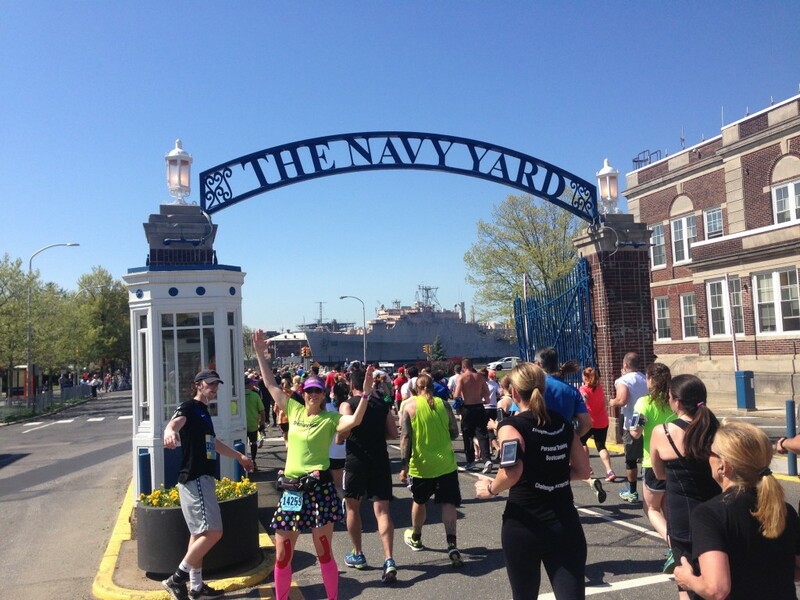 Post-race festivities for the Broad Street 10 Milers are held at the Navy Yard right past the finish line. I must say we didn’t find the after party too exciting, and it was crazy crowded, so we grabbed another free hazelnut ice cream and left to shower and change before heading home. We noticed as we walked to our cars in the Citizens Bank Park parking lot that a number of people were tailgating. 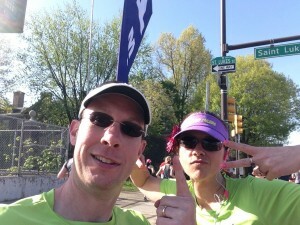 We made a mental note to plan for an epic post-race tailgate next time! I don’t really know if it was the race or because I was with my teammates that made this so much fun – I’m sure it was mixture of both! 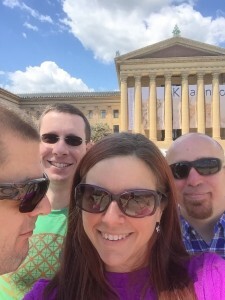 I hope to do the Broad Street 10 Miler again in 2016! Brittany Brown, a.k.a. Queen B, is a Certified Zumba Instructor, has completed multiple marathons, countless half marathons and the Dopey Challenge. She's also slightly crazy. You'll often find her yelling for no particular reason and then running off with maniacal laughter.